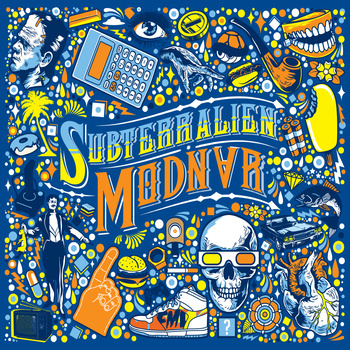 Subterralien (great name) is an electronica artist from Adelaide, Australia , formerly one of the members of Noise Puppets. The music he makes, which is all instrumental (at least on this album), is impossible to pigeonhole as it defies categorization, being a unique blend of various electronica genres melded together. One word that does suffice is psychedelic, and listening to this debut album Modnar (released in late October) can make the listener wonder whether someone has slipped some mescalin in their tea at times! For the sheer weirdness factor, it can be compared to such psychedelic classics as the LSD-drenched A Wizard, A True Star by Todd Rundgren and the truly bizarre Trout Mask Replica by Captain Beefheart. Modnar is the word ‘random’ backwards and that is apt as, although the music isn’t entirely random as such, it is constantly shifting under your feet and heading off in different directions. This is the case with opening track Mr. Hungry, seven minutes of intense, frenetic beats and quirky, angular synths. The drum programming is very intricate and strangely mesmeric but at first there is no obvious melody to latch on to. Around a minute in though, a catchy riff kicks in before it all goes wonderfully psychedelic and a voice tells you to ‘just lay back and enjoy the ride’. It’s good advice, and the next five minutes explore some wild sonic territory. Next track Lurger Time is slower paced but just as trippy, as if the acid is just kicking in. Sinister sounding basslines and eerie synths collide with a kaleidoscopic swirl of electronic melodies. Third track Madspace has another apposite title, and was a highlight for me, beginning with skittish hi-hats and mind-bending synths then developing a distinctive and catchy bassline that put a smile on my face. Like the rest, this piece evolves and morphs into different sections, ending with a blaze of bleeping arpeggios. After a surreal intro featuring spoken word samples Slapstick Maverick is the closest thing to a standard dance track on the album, featuring a frantic four-to the-floor beat, though the reaction to this played in a packed club might be interesting. At nine and a half minutes long, Mangoloid is the epic on the album, and impressively holds the attention throughout, featuring some superbly detailed and intricate drum programming. Who Knows is a beguiling listen with a particularly bonkers synth line and constantly shifting rhythmic patterns and time signatures. With its pounding techno kick, it could be considered a dance track, but good luck trying to dance to it. Bendy Arcade also has dance elements, the frenetic beat could almost be classified as drum ‘n bass for certain sections. I enjoyed the descending bass around the four minute mark, and the sitar-like synth that brings it to a close. Sim U Later explores a slightly slower, darker sonic universe. A moody, restless bassline pulses the track along whilst haunting synth lines build, meander and meld in the background. It starts to get busier at it progresses but there is a more low-key feel to this one, as if representing the comedown of the acid trip, the journey back to earth. Then again, it seems Subterralien has saved the weirdest till last with the brilliantly named Offal Chef , the finale of the album. Large amounts of the track contain no beat and resemble the psychedelic sound collages of Captain Beefheart’s surreal partner in crime Frank Zappa (circa Lumpy Gravy). It’s a disorienting but absorbing listen and a fitting end to proceedings. Overall, this is a sonically adventurous and highly original album that challenges the listener and explores some weird but wonderful musical territories. Without wanting to sound portentous, it’s music that reflects the era it was made in, an era of humans creating machines and creating with those machines. If your taste in music is more in the vanilla/mainstream category then this album is perhaps not for you, but for those bored of cookie-cutter chart music and endless predictability, why not take a trip down the rabbit hole and experience some music that will blow your mind? It’s quite a trip.